HomeBlogSleep & StressHow to manage stress? Our lives today have become more complex: faster paced, excessive workloads, the continual search for perfection, obsession with competition, difficulty in striking a work/life balance, lifestyle issues…Everything seems to ramp up the pressure! Stress, triggered by our way of life, affects all social groups and all age categories. No-one truly escapes it. However, some people are more deeply affected by its consequences, depending on their personal, psychosocial, professional and health background. The signs of stress are everywhere and it has far-reaching consequences. But what exactly is stress? It is a state of chronic tension (physical and psychological) stemming from the inappropriate long-term management of psychological pressure. In its initial phase, stress can cause short-term symptoms such as palpitations, a lump in the throat, irritability, anxiety, distress etc. However, over a long period of time, uncontrolled stress can prevent our body from functioning properly, weakening our cells and immune system. This means it can lead to a range of different health problems: stomach ulcers, heart attacks, high blood pressure, and even tumours in some cases. How to manage your stress and regain a sense of calm? 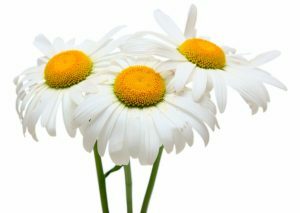 Matricaria or German chamomile should not be confused with Roman chamomile (more commonly used in France). Although both plants have substantially the same properties, they differ in appearance. Its high levels of flavonoids, including apigenin, have a calming effect on nervous agitation and depressive symptoms. 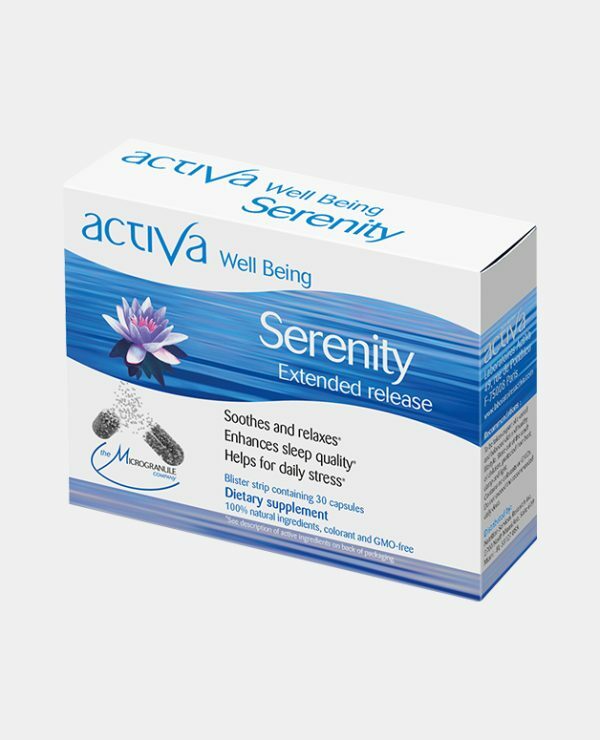 A study conducted by the University Science Center, Pennsylvania, showed that administering a standardized extract of matricaria, containing 1.2% of apigenin, to patients suffering from diagnosed anxiety disorders, results in significantly reduced symptoms compared with those patients taking a placebo. Thanks to the plant’s concentration of mucilage, it soothes irritations of the stomach’s mucous lining. In addition, mucilage is highly effective in relieving digestive problems and menstrual cramps. It is also used to relieve facial neuralgia: its gentle action means it is especially good for use with children and infants. In fact, matricaria is recommended for the relief of colic in babies in the first few months of life. 2- Hawthorn: treats palpitations and calms the central nervous system. Hawthorn has been used since ancient times by the Greek physicians, as well as in traditional Chinese medicine. In Europe, it is recommended as a treatment for heart problems, stress and insomnia, which can be stress-related. Hawthorn has a complex composition. It contains a blend of active ingredients that work synergistically, meaning that no one molecule can be singled out to explain Hawthorn’s benefits. 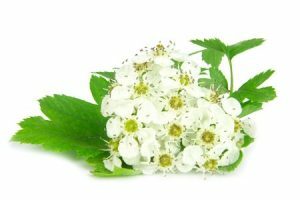 Hawthorn is, in fact, a cocktail of flavonoids, including hyperoside and vitexin, which play a role in regulating heart rate by reducing palpitations, along with the sensation of a pounding heart in anxious, stressed and nervous people. By calming these palpitations, hawthorn has a sedative effect on the central nervous system. 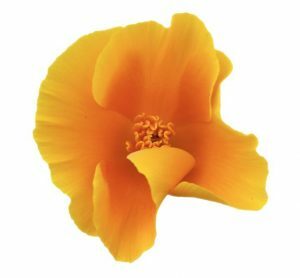 More commonly known as California poppy, eschscholzia is a natural sedative and anti-anxiety remedy. It is a sleep aid (hypnotic), calming both children and adults and helping to induce sleep and alleviate night awakenings and nightmares. More widely, it improves mental health problems by normalizing psychological function. Without creating a dependency, it also relieves nervous tension, stress and mild anxiety, which causes palpitations or tightness in the chest. The synergy between these different plants helps to combat nervous tension, irritability and anxiety effectively and comprehensively, without undesirable side effects. A natural complex is available, formulated from these plants, which work synergistically to deliver active ingredients that are highly biocompatible and bioavailable. It is produced by Laboratoires Activa under the name “Serenity”. 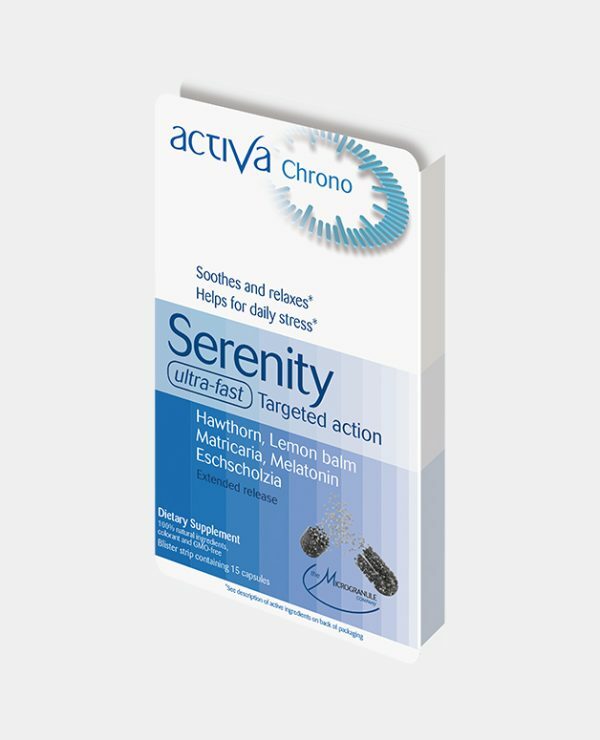 It is available in the Well-Being range, for all-round action and preventive care, and in the Chrono range, for use in a crisis. The perfect way to maintain inner peace and serenity! Ballard CG, O’Brien JT, et al. Aromatherapy as a safe and effective treatment for the management of agitation in severe dementia: the results of a double-blind, placebo-controlled trial with Melissa. Amsterdam JD1, Li Y, Soeller I, Rockwell K, Mao JJ, Shults J., A randomized, double-blind, placebo-controlled trial of oral Matricaria recutita (chamomile) extract therapy for generalized anxiety disorder. Depression Research Unit, University Science Center. combination containing two plant extracts (Crataegus oxyacantha and Eschscholtzia californica) and magnesium in mild-to-moderate anxiety disorders. Étude sur l’Eschscholtzia californiamenée par l’équipe du Laboratoire de Pharmacognosie de l’université de Metz. 9. Brzezinski A, Vangel MG, et al. Effects of exogenous melatonin on sleep: a meta-analysis. Sleep Med Rev. 2005 Feb;9(1):41-50.10. Buscemi N, Vandermeer B, et al. The efficacy and safety of exogenous melatonin for primary sleep disorders. A meta-analysis. J Gen Intern Med. 2005 Dec;20(12):1151-8. Detanico BC 1 , Piato AL , Freitas JJ , Lhullier FL , Hidalgo MP , Caumo W , Elisabetsky E .Antidepressant-like effects of melatonin in the mouse chronic mild stress model. Eur J Pharmacol 2009 1 Avril; 607 (1-3): 121-5: 10.1016 / j.ejphar.2009.02.037. Epub 2009 le 26 février. 35. The use of exogenous melatonin in delayed sleep phase disorder: a meta-analysis. van Geijlswijk IM, Korzilius HP, Smits MG. Sleep. 2010 Dec;33(12):1605-14. 12. Effect of melatonin administration on sleep, behavioral disorders and hypnotic drug discontinuation in the elderly: a randomized, double-blind, placebo-controlled study. Garzón C, Guerrero JM, et al. Aging Clin Exp Res. 2009 Feb;21(1):38-42. Mcllwain H. Adenosine in neurohumoral · and regulatory roles in the brain. ln : Genazzani E, Herken H, eds. Central Nervous System – Studies on metabolic regulation and Junction. Berlin : Springer Verlag, 1973 : 3-11. Harms HH, Wardeh G, Mulder AH. Effects of adenosine on depolarization-induced release of various radiolabeled neurotransmitters from slices of rat corpus striatum. Neuroplw.muJCology 1979 ; 18 : 577-80. Harms HH, Wardeh G, Mulder AH. Effects of adenosine on depolarization-induced release of various radiolabeled neurotransmitters from slices of rat corpus striatum. Neuroplw.muJCology. 1979 ; 18 : 577-80. Berne RM, Rubio R, Curnish RR. Release of adenosine from ischemie brain. Effect of cerebral vascular resistance and incorporation into cerebral adenine nucleotides. Circ Res 1974- ; 35 : 262-71. Maitre M, Ciesielski L, Lehmann A, Kempf E, Mandel P. Protective effect of adenosine and nicotinamide against audiogenic seizure. Biochem Plw.muJCol 1974 ; 23 : 2807-16. Jones P, Bachelard HS, Studies on amino acid metabolism in the brain using 15N-labeled precursors.